Justice and Human Rights Minister Patrialis Akbar said Sunday he planned to release a number of Papuan political activists jailed for campaigning for separation from Indonesia. The minister said during his visit to Papua that he would discuss the plan with President Susilo Bambang Yudhoyono and Coordinating Minister for Political and Security Affairs Widodo AS. The policy, he explained, aimed at stabilizing the restive province. “We will see whether they were involved in major crimes such as murder or whether they were only participating in a rally,” he said in Sentani Airports in Jayapura. Human rights groups have criticized the Indonesian government for jailing Papuans for joining separatist rallies, hoisting the flag of the Free Papua Movement or campaigning for separatism. The day before, a leading figure from the outlawed Free Papua Movement (OPM), Nicholas Jouwe, received his Indonesian citizenship documents in Jayapura on Saturday from Patrialis. “It’s impossible for Papua to separate from Indonesia and Indonesia can’t be apart from Papua. We’re part of the country,” said the 87-year-old man, who was returning to the country after living in the Netherlands for 42 years. 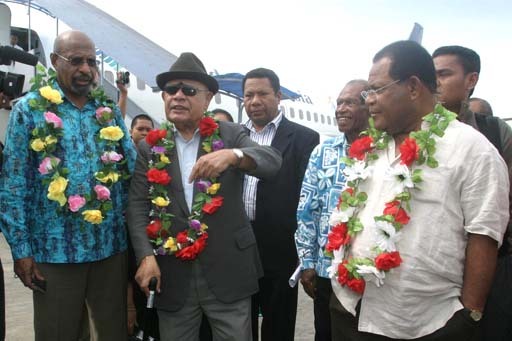 He said he had returned to live in Papua and help the government develop Papua and improve welfare there.